Area 7-DK is the ninth course of Cannon Cove and the sixty-third course overall in Mario vs. Donkey Kong: Mini-Land Mayhem!. It is a boss fight against Donkey Kong. The level is an arrangement of several Cannons and Red Girders that can be drawn to reach certain Ladders, with some Rock Blocks as well. Donkey Kong may occasionally hit a switch, disabling some Red Girder connectors and Cannons while re-enabling others. He may also pound the ground to cause some Barrels to fall down; hitting these will cause a Mini Mario to break, though they can be blocked by any kind of Girder or taking cover in any Cannon. 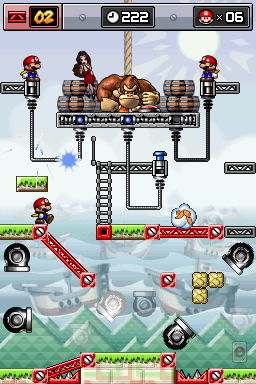 The Mini Marios must climb the Ladders in order to run a spark through each wire, electrocuting Donkey Kong. The M-Token is located near the top left, between a Cannon and a set of twelve Rock Blocks. In Plus Mode, it is in the same location. The Mini Mario Card is located near the bottom right, just to the right of a Spike Trap. In Plus Mode, it is in the same location. There is no specific order of Minis in Plus Mode. Additionally, practically all of the Cannons have been realigned. This page was last edited on February 26, 2018, at 03:00.